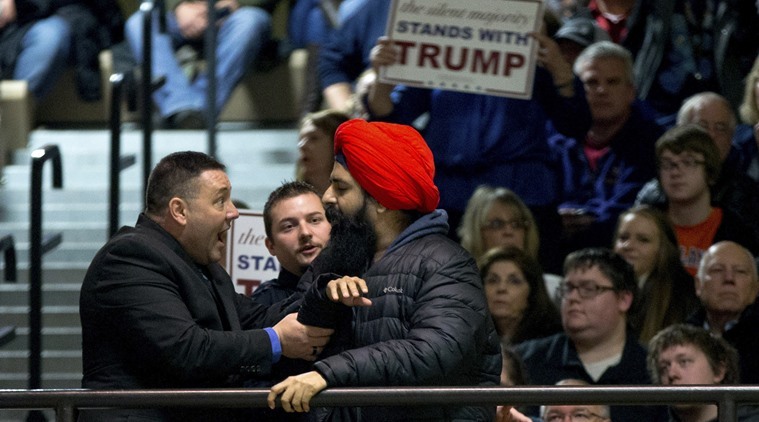 A Sikh protester is removed from a Trump rally. In other words, it is perfectly reasonable to read the text in a way that says the Israelites did not fear God! How can this be? Was it that the stragglers lost faith, thus becoming vulnerable to Amalek? What kind of God would allow such a thing? Furthermore, the command is to remember what Amalek “did to you,” and we get the sense that the concern is not only external—a cowardly attack on the weakest Israelites—but also internal. Our sages have long intuited that Amalek represents, yetzer ha’ra, internal corruption. The verses just before this passage in Deuteronomy 25 speak about unethical business practices—the keeping of uneven weights by merchants, which is an “abomination to the Lord.” The juxtaposition implies that it was our own corruption that made us susceptible to attack. Amalek is the evil inclination, and when we allow its voice to control our conduct, we cheat others and become worthy of attack. If we look back to Exodus 17, the original narrative of Amalek’s attack is preceded by the complaints of Israel, who said, “is the Lord in our midst or not?” In both places internal discord leads to external disaster. This is hardly a coincidence. What was true of ancient Israel is true of modern Israel, and also of America. There are very real external enemies such as ISIS, Hamas, Hezbollah, and the waves of lone wolf terrorists in Israel who have carried out savage stabbing attacks in Israel. We remember Taylor Force, an American business student at Vanderbilt, who was stabbed to death in Jaffa. Our community and our country must be strong, vigilant and brave in facing and fighting these real external threats. At the same time, I am gravely concerned about the danger to both Israel and to America that comes from within. When we abandon our better selves and give in to fear, anger and hatred, then we become weak and unworthy. The recent Pew study of Israel shows that a majority of self-identified religious Jews wish to “transfer” Arabs out of the country. This, I believe, would be a betrayal of Israel’s Declaration of Independence and of the democratic nature of the State. Likewise, I am deeply concerned about the political atmosphere in America. Our political system has been ugly and mean-spirited for years, but never before have we seen blatant calls by a major candidate for President to incite mob violence against his detractors. Until now. Our democracy thrives on disagreement and spirited debate over issues of substance. Without these basic pillars, democracy crumbles. When we remember Amalek, we not only remember Amalek’s attack, we remember the response of the Israelites to this disaster. At least according to one reading of the text, the response was less than satisfactory. It made the disaster worse instead of less severe. Zakhor et asher asa lekha Amalek, “Remember what Amalek did to you,” rings true today. It’s not just the physical attack, but also the osmosis of Amalek-like thinking into the psyche of the Israelites that dehumanized the most marginal members of their society at the time of their greatest need. Shabbat Zakhor is an annual check-in for us. It’s a reminder of what we’re “here after.” Let us resolve this Shabbat Zakhor, that we will not marginalize others and strive to bring healing and kindness to our community. May our renewed resolve usher in a joyous Purim.